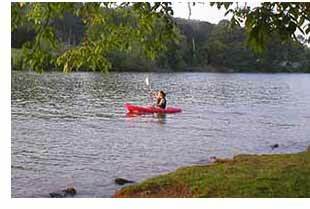 Knoxville Canoeing offers many opportunities to enjoy waterways. Some of the more popular areas to canoe are at Concord Park and the Volunteer Landing area. Knoxville's waterways provide excellent opportunities for canoeing. Some of the more popular areas to canoe are at Concord Park and the Volunteer Landing area. Coast along Knoxville's waterways, the Holston and Tennessee Rivers. To begin your adventure, catch KAT bus 32 from Knoxville Station to the Boyds Bridge Pike stop. Walk down the road and take a left on Holston Hills Road. Bus schedules are available at www.katbus.com. The bus trip takes about 40 minutes. Short tours are $20 and the longer tours are $40; canoes are provided. Call ahead for reservations (in Knoxville, dial 311). KARM Dragon Boat Festival -- The Dragon Boat Festival is one of Knoxville’s unique fundraising events. It provides a great corporate, community, and churchteam building experience, while raising funds for KARM. Teams of 20 paddlers, a drummer and steerer race in authentic Hong King-style, 46-foot-long dragon boats. All ages, skill levels and physiques can paddle, making it the ultimate team sport.